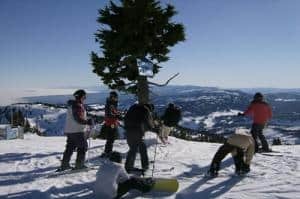 Mount Washington is the largest mountain resort for downhill skiing, snowboarding, cross country skiing, snowshoeing and mountain biking located on Vancouver Island in the province of British Columbia, Canada. The mountain resort is a year round recreation destination located near the island communities of Courtenay , Comox and Campbell River, BC. The mountain itself plays centre stage in Vancouver Island's 500,000 acre Strathcona Park. The rugged terrain of Mt. Washington spans 647 hectares ( 1600 acres ) enjoying a summit elevation of 1588 metres. Located at the base of the mountain, at 1175 metres, is a fully serviced Alpine Lodge, accommodations and chalets. During operating hours the Alpine Lodge provides many of the services required by adventurers when on the mountain like accommodations, washrooms, cafeteria, pub, restaurant, gift shops, storage lockers and rental stores. Raven Lodge has a restaurant, rentals and a sport shop also. Operating hours vary per season. During the winter months Mount Washington is at its busiest. 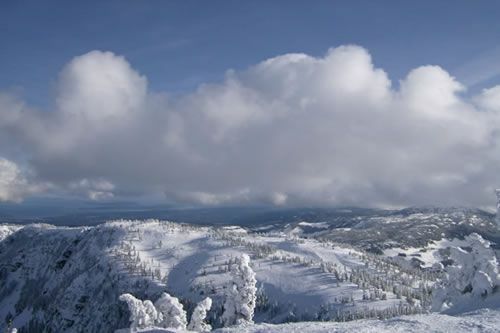 Downhill skiers and snowboarders enjoy over 60 named ski and snowboard runs. 35% of the alpine runs are considered intermediate, 20% are beginner ski runs and 45% are considered expert runs. The entire mountain is serviced by 7 lifts. The front side of the mountain (505 metre vertical rise) is serviced by the Hawk 6-Pack Chairlift, the Eagle Express, Whiskey Jack, Sunrise Quad, Green Chair and Discovery Platter. The back side of the mountain with a 362 metre vertical rise is known as The Outback. The Outback includes "back runs" covering 400 acres of bowls, glades and tree skiing terrain with big steeps and drops. The backside is serviced by the Boomerang Chair (4-person). Mt. 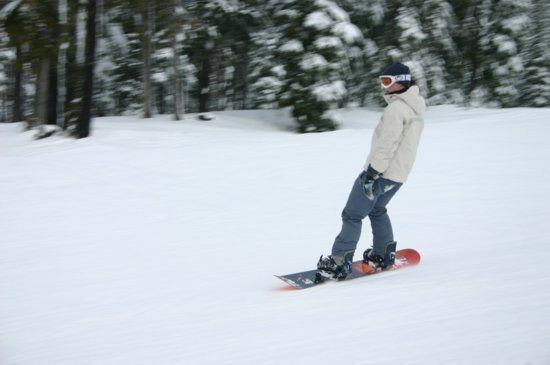 Washington includes two terrain parks attracting snowboarders. The Stomping Grounds Terrain Park is the more difficult park including many jumps, rails, rollers, wall rides and snow mounds. The snowboard park referred to as the Easy Rider is an easier terrain park for boarders to learn the trade. Mount Washington enjoys over 14 named nordic trails with over 55 kilometres of classic and skate skiing. The Nordic Centre is open at 8 am and provides rentals, maps and lessons. The nordic trails cater to all skill levels with 14% being beginner green trails, 43% being intermediate trails and 43% advanced trails. Many of the cross country nordic trails explore Paradise Meadows on Mount Washington. Other activities on the mountain, enjoyed by all during the winter months, include the 300 metre natural luge track. and the Ozone Snow Tubing Park. Summer activities on Mount Washington, like mountain biking and hiking, enjoy many breath taking views and downhill adrenaline rushes. The 18 mountain biking trails on the mountain are serviced by two lifts. The trails vary from expert to beginner. There is a downhill and slope style course also available on the hill for experienced riders. The mountain biking centre includes a skill centre, lessons and rentals. How to Get Here: Travel to Vancouver Island in BC, Canada. From south Vancouver Island travel north on Hwy #1 to the community of Courtenay, BC. From Highway #1 near Courtenay take the Mt. Washington turn off and continue up the mountain to the main lodge and parking lot. It should be 20 -30 minute drive depending on road conditions. From north Vancouver Island travel south to Courtenay along Hwy #1 to the same mountain exit.